Stainless electrical component plate to fit the SR500 & SR400. 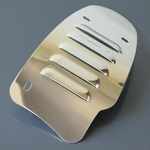 This is a quality heavy gauge stainless steel electrical component mounting plate with a brushed finish. An attractive solution for mounting your various electrical components beneath the seat when eliminating the airbox and (or) battery. The plate has been precision cut and pre-drilled for easy installation, using the original frame mounting tabs.